At the supreme level, the universe is a simple undivided unity: the Tao. The Tao is the perfect blending of the two supra cosmic forces: Yin and Yang. This trinity of yin, yang and tao(balance) in their many permutations combine to form all things seen and unseen, concrete and conceptual in their infinite variety. There is a definite beauty and eternal structure, beyond existence and nonexistence which orders the universe. Mathematically the permutations of of yin, yang and tao can be seen to progress from ultimate simplicity(undiferentiated tao) to infinite complexity. In order for the human mind to make sense of this bewildering variety we divide all things into sets corresponding to their natures. These sets fall into distinct levels corresponding with their level of conceptual complexity. I am not dealing with temporal phenomena here such as a chair or a piece of fruit(or their concepts)! I am talking about relatively simple universal concepts. I am going to illuminate for you the basic structure of the first 4 levels of conceptual complexity. Each level corresponds with one of the four levels of geometric complexity: ie the point, the line, the face and the volume. This level corresponds with the Undifferentiated Tao: The perfect blending of yin and yang. This level corresponds with the the 3 Properties: yin, yang and tao which in "extension"
=the 4 Permutations of yin and yang. The 4 are identical with the holy four fold name. This level corresponds with the 9 Permutations of yin, yang and tao which in extension= the 16 Permutations of yin and yang. 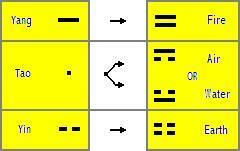 The 16 are identical to the 16 figures of geomancy. This level corresponds with the 27 Permutations of yin, yang and tao which in extension=the 64 Permutations of yin and yang. The 64 are identical with the 64 hexagrams. I conceived of these a 7 fundamental diagrams but later realized that they were merely the first in an infinite series of trinary and and binary diagrams. So in some sense this set is obselete and I have written more advanced pages elsewhere. However you may still find this section interesting.